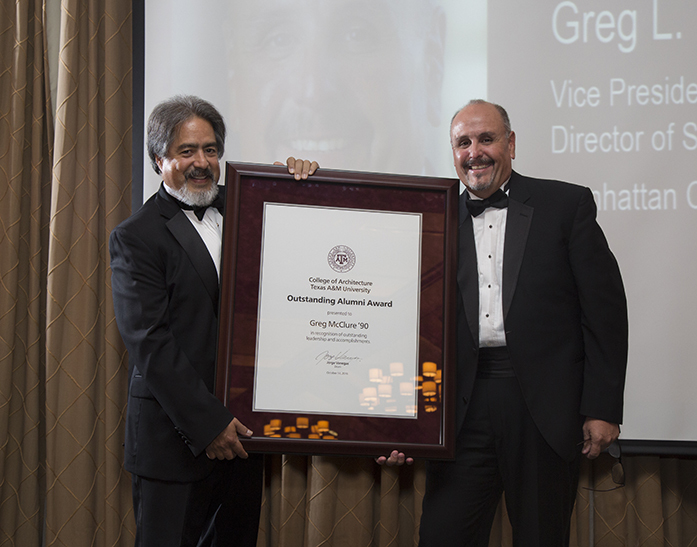 Manhattan Construction Vice President of Sports Greg McClure was honored by the Texas A&M University College of Architecture with the Outstanding Alumni award on October 14, 2016 in College Station, Texas. This honor was bestowed upon seven former students who have shown outstanding achievements in their careers since graduating from the program. The nominations are by former students of the university who see these individuals performing in a way that shows excellence in what they do. McClure served as Manhattan’s project director on the $441 million renovation of Kyle Field at Texas A&M where his efforts were highly visible to the former student community. “I am just very grateful that my college feels I have done something worthwhile in my career to-date,” McClure stated when asked how he felt about this honor. You are currently browsing the Manhattan Construction Group blog archives for October, 2016.